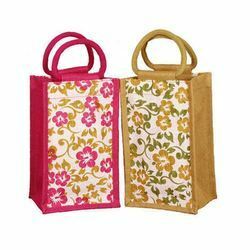 Our range of products include single jute bottle bag, printed bottle bags, jute bottle bag and wine bottle jute bag. 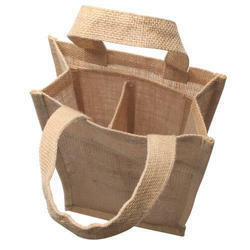 With phenomenal market understanding, we are able to introduce an extensive range of Single Jute Bottle Bag. These bags are designed and developed using quality materials. At our production unit, we produce all types of bags for the clients. The offered bags can carry all kinds and sizes of bottle. Also, clients can get these bags in bulk quantity from us. Backed by our years of industry experience, we are betrothed in presenting an excellent quality of Printed Bottle Bags. These bags are trend setter elements among the youngsters. The offered bags are designed using quality cloth, threads and advanced printing machines. Fantastic posts, colour and unique style of the bags catch every eyeball in the markets. 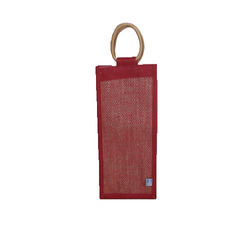 With an aim to fulfil varied requirements of our valued clients, we are engaged in offering Jute Bottle Bag. These bags are used in carrying bottles and lunch boxes by the school, college, office goers and travellers. The robust structure and comfortable design help users to utilise the bags in office, schools and colleges easily. Also, clients can avail the bags according to the required specifications from us. 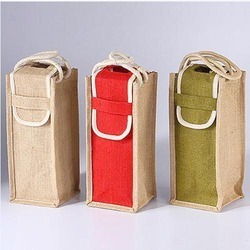 We are successfully ranked amongst the top notch entity offering a wide range of Wine Bottle Jute Bag. This bag is crafted using strong thread and advanced sewing machines by the veteran craftsmen and tailor in the manufacturing unit. The offered bag is used in carrying small but delicate items. In order to provide an attractive bag to the customers, we design and use a variety of colour threads to woo the users. Looking for Bottle Bags ?